A fast track contract for the installation of bearing piles and pile caps to support a new glass manufacturing and bottling plant on the site of the former Ince B Power Station in Cheshire. The works were fast tracked to permit the structural steel contractor to commence work on site only 6 weeks after piling commenced. The installation of some 8,750 load bearing piles, in diameters varying from 300mm to 500mm and load bearing capacities of 50 to 100 tonnes. A sheet piled cofferdam, some 100 metres long was also completed within this time to enable the construction of a concrete batching plant. 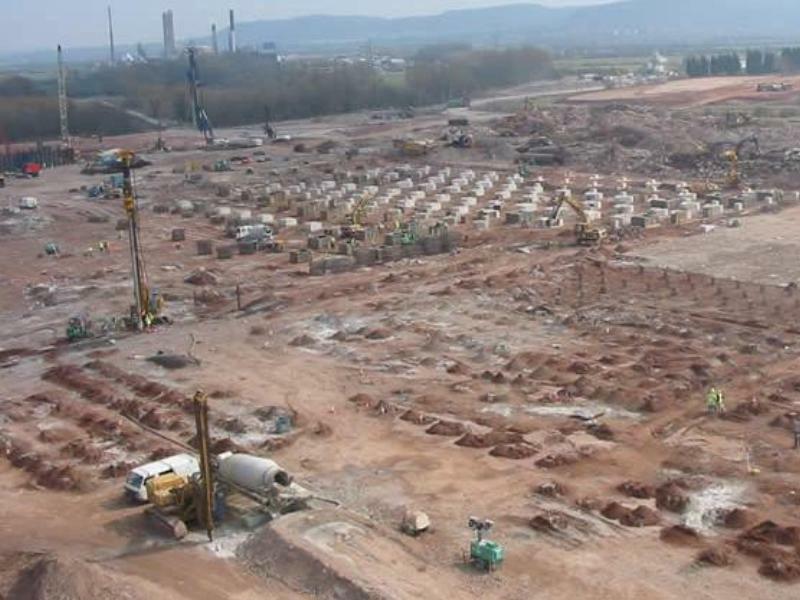 All piles were on the critical path for the project and all sections of piling were handed over on time, which was instrumental in the overall £200M plant being completed on time. 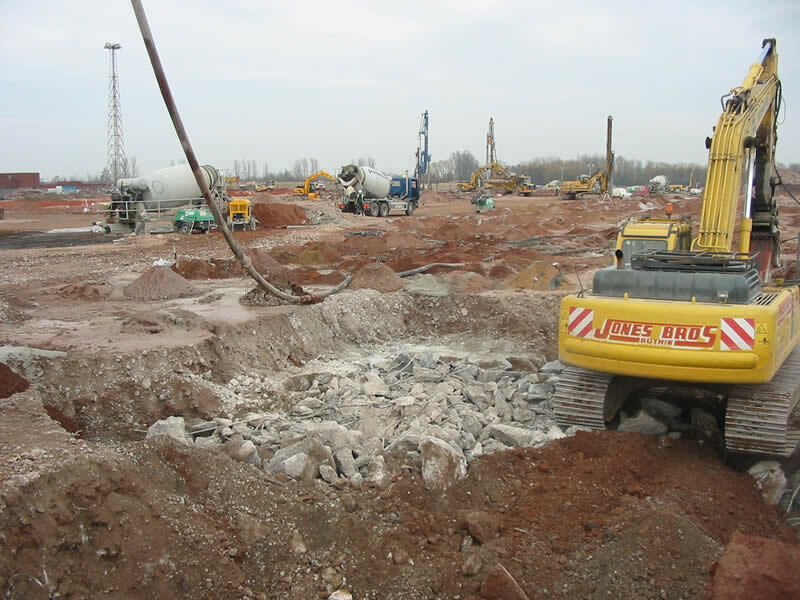 Due to a combination of varying geology across site and varying performance requirements for the piles, two types of piles were used. 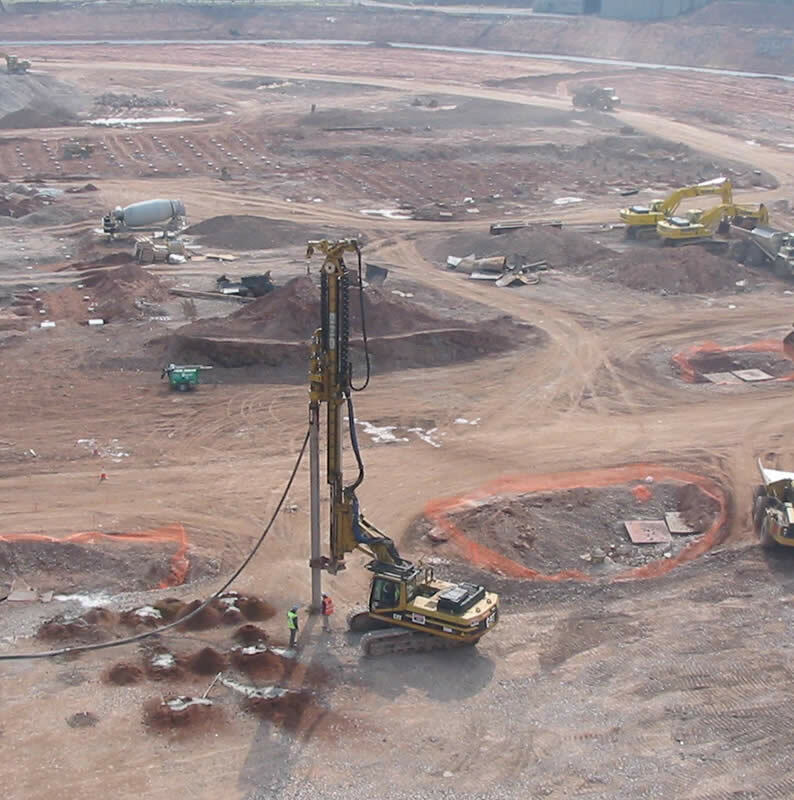 Vibro-displacement techniques were used where 20mm settlement at working load could be tolerated with the piles toeing into the underlying stiff clays; this was generally at the northern end of the site in the Production Building. At the southern end of the site, a cased CFA system was used, coring into the underlying Bunter sandstone to achieve a rock socket, and where permissible settlement was onerous at less than 5mm, under a working load of 100 tonnes. These piles were installed for the Warehouse building. Piling operations had to be carried out around and through the remnants of the old power station, which had previously occupied the site. The original contract was for the piling works only, however, the client subsequently added in the construction, in reinforced concrete, of all the pile caps. This included, for the Warehouse structure, some 3,800 single pile caps, and, for the Production building, some 1,000 pile caps for groups of 3-4 piles, with 3-4m3 of reinforced concrete in each cap. Substantial completion of the piling package, to the client's programme, was achieved in 4 months, with a production averaging some 1,900 piles per month. This was against a fast track background of continual design/drawing issue, as the Client's consulting engineers developed the design concurrently with construction on site. The work was completed on time, within budget and to the required quality.